I had a piece of fabric left over from some upholstery in my living room. 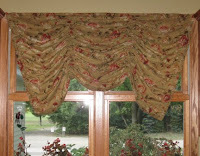 Since the central part of my home is a great room, this fabric would coordinate well on my kitchen window. I decided to try an Austrian Shade as I've never used shirring tape. I learned a lot in this experiment. Mathematically it should have made sense to me that when you sheer up the fabric, the shade will get smaller width-wise, but that realization didn't come until I was finished with the shade and mounted it to the board. In this case, this is all the fabric I had left over so it's not like I could have actually adjusted the size, but I do need to learn how to estimate fabric for something I want to hang end-to-end across the width. I also learned that I need to anchor the ends of the tape better as I pulled the shirring strings right out of one of the sides which resulted in my having to patch another piece. I also pulled the shirring strings from the bottom, which after reading one of my books I saw I should have pulled from the top. But for now, here's my kitchen treatment and I'm a little smarter.